Tom recently moved from Vail, Colorado where he and his wife, Laura were Co- Directors of Tennis at Homestead Court Club. Prior to that he was a Tennis Professional/ Junior Tennis Coordinator at Boulder Country Club in Boulder, CO. He has been working in the tennis industry for over fifteen years and thoroughly enjoys spreading his love for tennis to all of his clients. 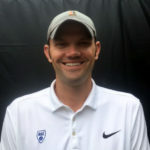 Tom graduated from the Professional Tennis Management program at Ferris State University in 2003 and he played on the nationally ranked Ferris State Men’s Tennis Team. In his free time he enjoys hanging with his family as he and Laura have an active three year old son named Hayden and a newborn daughter Cody. Tom is an outdoor enthusiast and is always up for a fun and or challenging adventure.